Positioned in the Heart of America, Kansas City’s central location makes it easily accessible by interstates and highways, as well as a quick flight from just about anywhere in the nation. And once you arrive, everything is within reach. Kansas City is the most centrally located major metropolitan area in the United States, making it accessible from nearly anywhere in the nation. 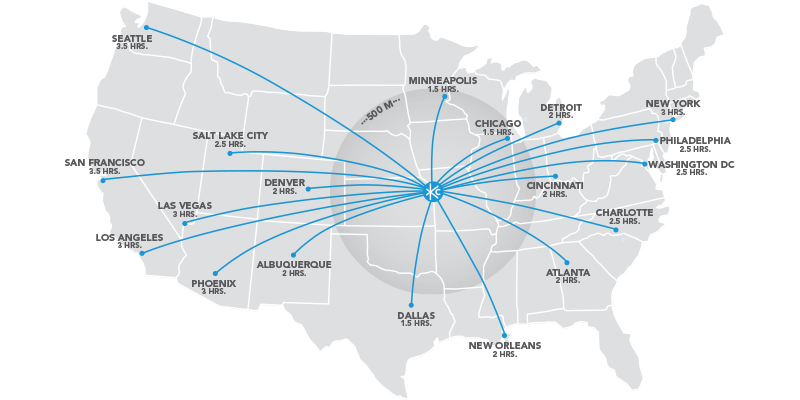 If you're flying, Kansas City is just a three-hour flight from either coast. 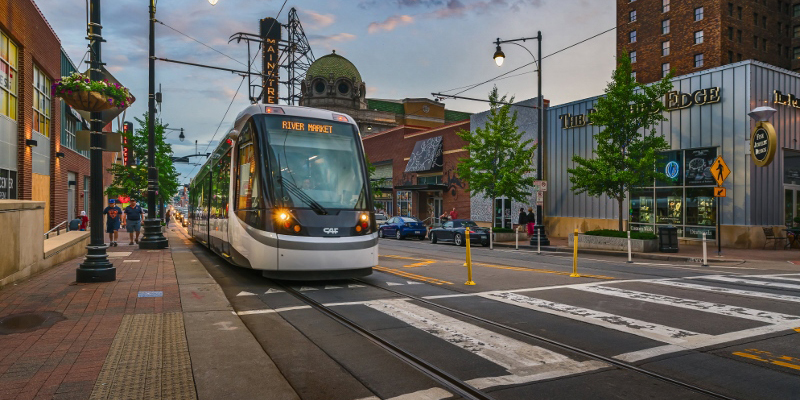 The two-mile, north-south KC Downtown Streetcar starter line runs from River Market to the historic Union Station, traveling mostly along Main Street. Areas serviced include the Central Business/Convention District, the Power & Light District and Crown Center—not to mention the numerous business, restaurants, art galleries and residences along the way. Learn more. RideKC Bike is a 24/7 public bike share system for short trips. Bikes are located at hubs and stations around the Kansas City metro, and the system includes smart, electric-assist bikes as well as traditional pedal bike options. Learn more. Kansas City is an Uber-friendly community on both sides of the state line. Additionally, there are options such as Z-Trip. RideKC offers bus service in the Kansas City region, including downtown, KCI airport and the Country Club Plaza. Download the RideKC App to plan your trip, track your ride and pay your fare. Learn more. Kansas City’s public bus system, serves all of the major metropolitan areas, plus most adjacent communities. The Metro operates at KCI Airport Monday through Friday. Many rental car companies are available at KCI Airport and throughout the city. Taxi and car services are available throughout the Kansas City metro area. Taxi stands are located at all major hotels, shopping and entertainment districts. Taxi fare starts at $2.50 with an additional $2 per mile and $1 for any time spent waiting in traffic. Traveling from the airport to downtown via taxi will cost you about $50. Phones for taxi service are located both inside and outside each terminal at baggage claim areas, and at other convenient locations outside terminal exits. Need to find your way around Kansas City? View our maps section for landmark highlights, points of interests, major roads and highways, and neighborhoods located throughout the KC Metro area.